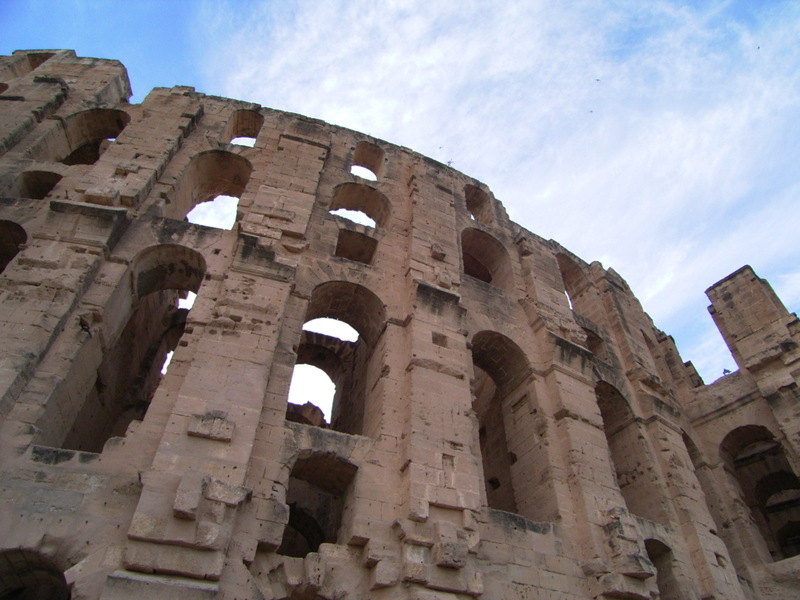 Explore Tunisia’s Culture and History Tour is a great introduction to the History and culture of Tunisia. In 9 days tour you will be able to explore the amazing UNESCO World Heritage Sites of Carthagethe, Tunis renowned Medinas, as well as Bardo National Museum & its best collection of mosaics in the world. Kairouan city is also a UNESCO World Heritage Site. Visiting the charming village of Sidi Bou Said. Travelling back in time at the extraordinary amphitheatre of El Djem. Discovering Berber Life and architecture at Matmata and its troglodytes underground houses, and visiting the famous movie ” Star Wars ” locations. Experience a desert camel trek into the sahara desert of Douz-Tunisia. Sbeitla and Makthar the best preserved archaeological sites in Tunisia. The UNESCO World Heritage site of Dougga. Tour Duration: 9 Days – 8 Nights. Highlights: Tunis – Dougga – Carthage – Sidi Bou Said – El Djem – Matmata – Douz – Chott El Jerid – Tozeur – Kairouan-Sbeitla . Tunis – Medina – Carthage – Sidi Bou Said – Tunis. 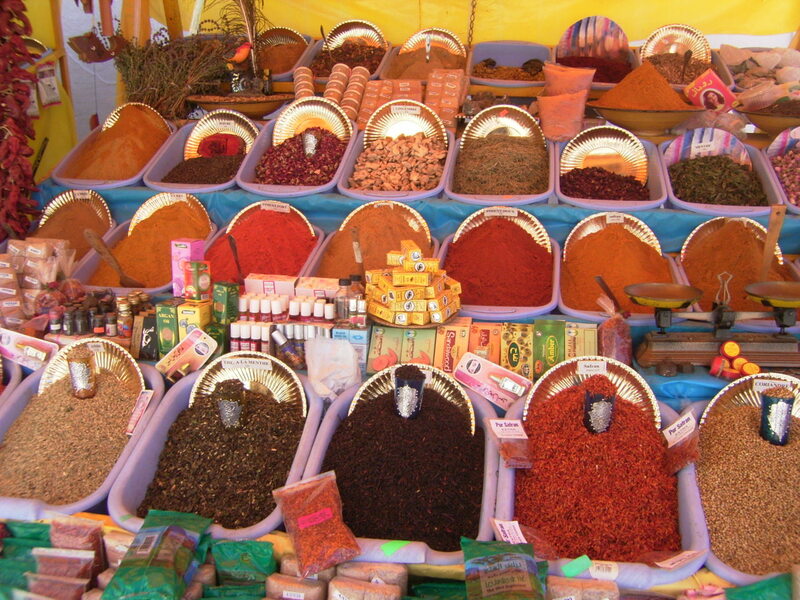 You will start your tour with exploring Tunis old Medina, one of UNESCO World Heritage Sites. Then you will visit the Bardo national museum including its wonderful collection of Roman mosaics, Greek bronze statuary and Islamic artefacts. After lunch we will drive to the Phoenician trading port of Carthage, and the most important city of the Roman Empire. We leave Carthage towards the charming city of Sidi Bou Said, walking through through its beautiful streets and traditional white & blue houses. Then we return to Tunis, where we spend the night. 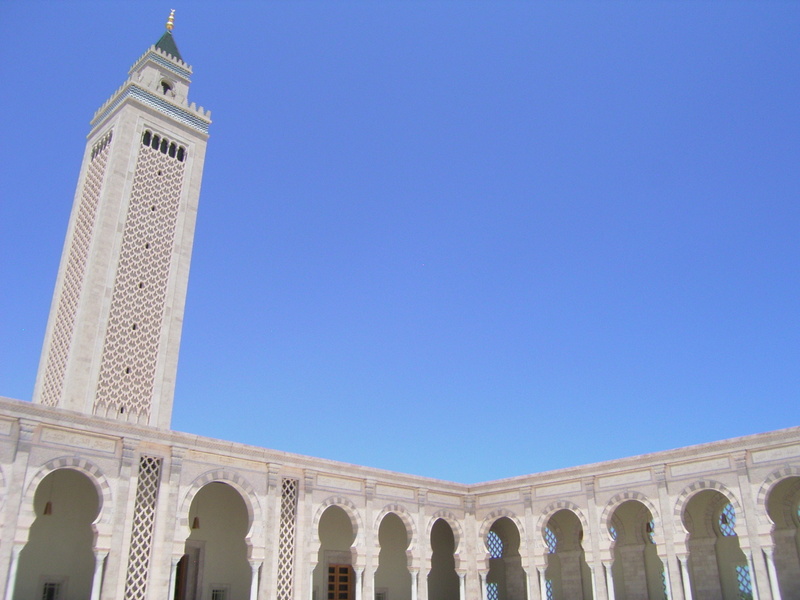 Tunis – Kairouan – El Djem – Sfax. Morning drive to Kairouan. The city is a UNESCO World Heritage Site and Islam’s holy centre. We visit the Great Mosque, one of the most important Mosques in Tunisia. 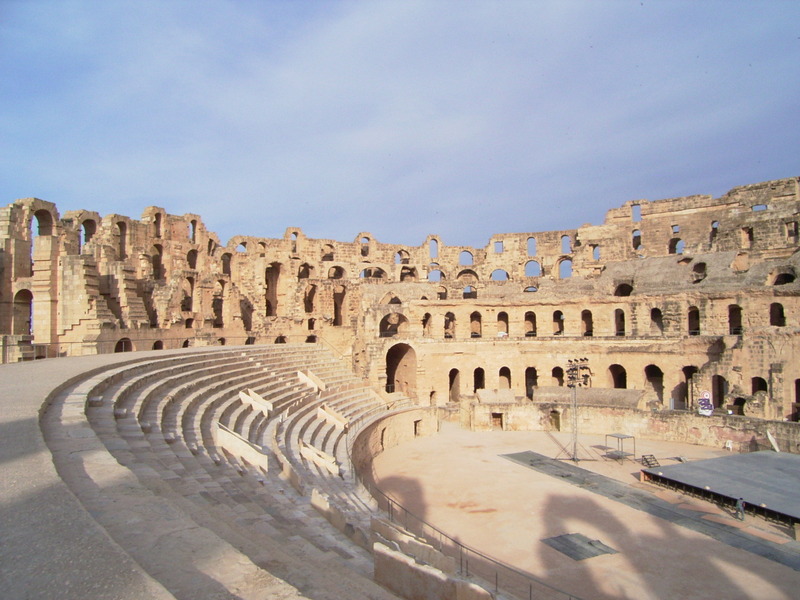 After that we head to the north of Tunisia to visit the amazing amphitheatre at El Djem, and we finish our day in Sfax, where we spend the night. Sfax– Matmata – Douz – Sahara camping . We continue our tour across the desert landscapes to Matmata the land of troglodytes, Berber people who live underground. Matmata has become very famous recently of the Star Wars movies. We visit some of the film locations and nearby troglodyte homes. Continuing to Douz, the gateway to the Sahara desert we will visit the Sahara Desert museum, then we will meet with the camel drivers for a trek into Tunisian Sahara. Where you will taste the traditional food, and bread baked in the hot sand, and enoy a traditional music around the camp-fire. We will have our dinner and overnight in a Bedouin camp style. Sahara camping – Douz – Chott El Djerid – Tozeur . Today we leave our camp-site for a drive to Tozeur via ‘salt lake’ Chott El Djerid. The town of Tozeur and its oasis is a very popular and beautiful tourist destination. We enjoy the landscapes and spend the night in Tozeur. Tozeur – Metlaoui Mountains – Red Lizard Train – Tozeur . Today we will drive via the spectacular landscapes of Metlaoui Mountains, close to the Algerian border with Tunisia. Heading to Metlaoui town for a ” Red Lizard train” excursion (tickets are included) . It is an old wooden train. The Red Lizard Train runs through a spectacular views of beautiful rocky desert canyons and landscapes, passing through mountain tunnels, over steel bridges, natural water springs, and green oasis. Then we drive back to Tozeur for the night. Please note that if the Red Lizard Train is not available! then we will take an exciting 4×4 excursion through the same spectacular scenery instead. Tozeur – Sbeitla – Makthar – El Kef. 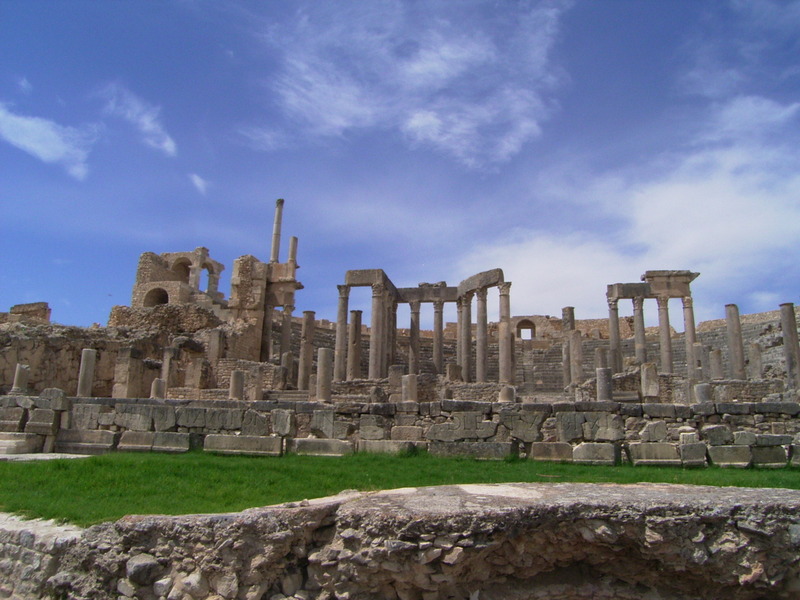 This morning we will drive to visit Sbeitla, the best preserved archaeological sites in Tunisia. After lunch we visit the Roman archaeological site of Makthar and then continue to the charming mountain city of El Kef where we spend the night. El Kef– Dougga – Bulla Regia – Tunis. 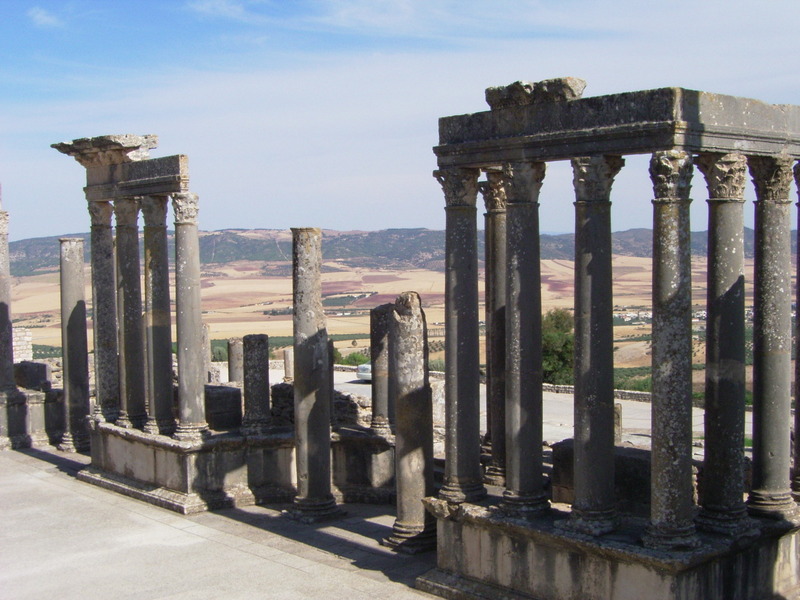 Today we will start driving to Dougga the Roman UNESCO World Heritage site, the largest and most magnificent archeological site in Tunisia. After that we continue to Bulla Regia site, the unique archaeological site in Tunisia to see its special architecture and mosaics. Overnight in Tunis.